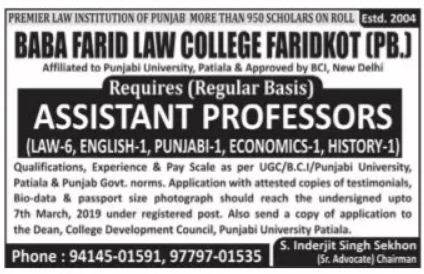 Baba Farid Law College, Faridkot has advertised in the TRIBUNE newspaper for the recruitment of Assistant Professor jobs vacancies. Interested and eligible job aspirants are requested to apply on or before 7th March 2019. Check out further more details below. College Profile: Baba Farid Law College, is a dream-come-true of its chairman S. Inderjit Singh Khalsa. Its campus is spread over 11.75 acres of land. It has state of the art three storied two academic blocks, top-tombed, hexagonal Administrative block. The College is proud of its well stacked centrally air cooled and computerized library, Staff Room, Separate Common Rooms for Boys and Girls, Canteen, separate Hostels for Boys and Girls, Moot Court Hall, Lecture Theatre and an air conditioned auditorium, Residential Quarters have also been provided for Teaching and Non-Teaching Staff members. The College is adorned by the grand statue of 'The Goddess of Justice' standing as guardian to inspire the teachers and the taught to bring social Justice in our society. How to Apply: Interested and eligible candidates are requested to send CV along with self attested copies of certificates and recent PP size photographs to the following postal address.